London is a city with an age-old history. A lot has happened over the hundreds of years it stood in stone silently watching its children. Some events were good. They bought prosperity. Others were bad. They brought demise. But there were also the ones that can be truly called… wicked. They gave birth to many blood-chilling Urban Legends that haunt the minds of Londoners to this day. How would you like to be frightened to the bone the next time you take a stroll after the sunset? Looking at the calendar, I would say that you‘d be quite fond of such an idea. Well, you have been warned. This story took place in 1837 when a servant girl Mary Stevens was on her way to Lavender Hill. As she walked through Clapham, a mysterious figure leaped at her, tore off her clothes with clams and proceeded to kiss her. On the very next day, that figure has caused a carriage crash and was seen breathing fire out of its mouth. It fled the crime scene by leaping over a nine-foot-tall wall. Needless to say, it laughed manically as the people of London lost sight of it. Thus the legend of Spring-heeled Jack was born. A legend that terrorized Victorian London for nearly a decade. Yes, a leaping man in a dark cloak may not seem like much today but don’t [ay too much attention to the name. The claws, the cloak, the jumping over walls and buildings – the people were haunted by a sociopathic, fire-breathing, Victorian Batman. People started spotting a mysterious grey figure roaming the cemetery at night in 1969. A dark man-shaped something seen in Highgate at night. With all due seriousness, if not a vampire, what else could it be? A zombie? We all know those things were not a thing before the mass spread of television. 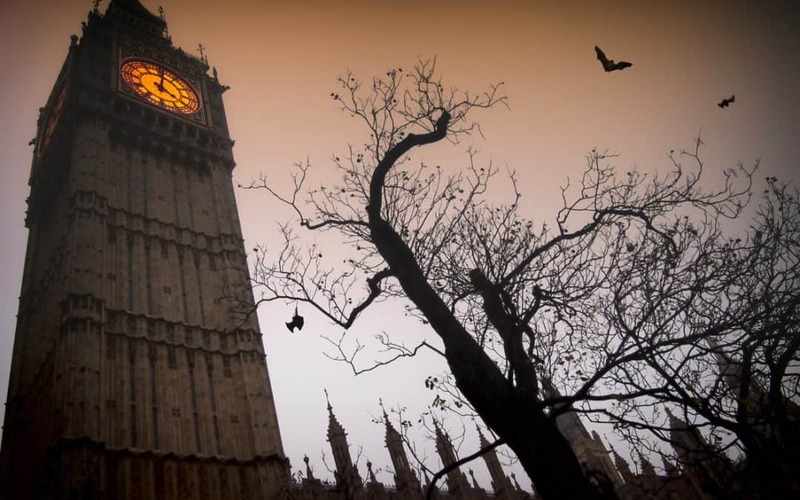 The people of London thought the same way as they rushed to the cemetery at night armed with crosses, garlic, and stakes Van Hellsing style. Alas, the good folk of London was unable to track the bloodsucker. The creature of the night apparently had Bobbies on his payroll as some good hunters were arrested for grave robbing. Can you think of a more ridiculous excuse to shut down a hunt on the prince of darkness? Originally spotted by 4 children in 1981, this hairy beast of great might has made a lot of noise back in the day. Some say jokingly that it is a modern-day hipster of Hackney stuck in a time loop, and I don’t even know if it makes things better or worse: Seeing a hipster in the eighties or fighting off a grizzly mountain of gore today. This is one of the creepier tales associated with the Epping Forest in Essex. The legend says that there were once tow love birds all Romeo and Juliet like and the girl’s father was against their relationship. As time came, the lovers confronted the old man in the woods, he gruesomely murdered them… As loving fathers do? Shortly after, the scene of a crime (which is a lake) turned absolutely black. The nature around it had died and the bodies followed shortly. No, not like that. The bodies weren’t following anything. They were being found near that lake. Firs a woman was found dead near the waters of the Suicide Pool, then a teenage girl and a baby. The rumors have spread that the lake itself is drowning people to their doom. How does that make it a “suicide” lake, you ask? Well, that’s a good, observant question to which I have absolutely no answers. But you can definitely check out the Epping Forest and look for an answer there. Although I wouldn’t suggest doing so. Don’t you just hate it when someone shows up at the party in the same dress you were rocking the whole evening? Imagine that someone having your face as well. Now you know how a civil servant has felt when he saw his own face across the Tavistock Square not once, not twice, but every evening as he walked home from work. The man tried to give chase but all of his pursuits were futile. Maybe that’s because the face shifter switched between its looks as they run. There was also a woman who has seen her dying sister across Russell Square and there were also other sightings of doppelgangers all over London. Why are they here? Why do they let people whose faces they’ve stolen see them? Maybe they are looking for more than just your face and if I were you, I wouldn’t chase a shapeshifter down a dark alley as I believe that some mysteries are better off without an answer. Ever since the fire that took place on November 18th, 1987 that took away the lives of 31 Londoner the cries of a small girl have never left the King’s Cross Tube station. A young woman with brown hair wearing jeans has been spotted crying at the station. That girl had a tendency of disappearing from plain sight once spotted and she was always followed by the smell of a burning fire and smoke. It is believed that the girl is one of the victims of the tragedy and her spirit failed to pass away because her body was never found. Would you care to take a look?